If New York mayor Rudolph Giuliani is successful in his U.S. Senate bid, we’ll find out soon enough. The dominant feature of Rudy Giuliani’s personality is a controlling, aggressive tendency, which is an attribute instrumental in his past political successes. 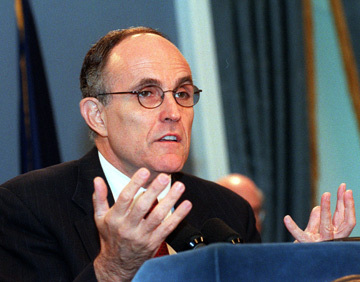 During his tenure in the mayor’s office, Giuliani has crusaded vigorously to reduce crime and clean up the streets of New York City. However, in doing so he has berated critics and tormented subordinates not acting fully in accordance with his wishes. Conscientiousness, the other prominent element of Giuliani’s personality, provides the underpinnings for honesty, integrity, and strong adherence to moral principle. But it also can cultivate compulsiveness — and Giuliani seems compelled to attend personally to every detail of a pet project. A prime example is his micromanagement of New York City’s police department. The U.S. Senate, however, is no place for pouncing on pesky squeegee men and harassing the homeless. Giuliani may be the biggest dog in New York City, but if elected to the Senate, he’ll have 99 fellow political pooches of like proportions. As surely as the sun rises, some of those senators will cross swords with Giuliani. Simply browbeating or bullying them away, as has been the mayor’s habit, will no longer be an option. But as president, his hostility would have global implications. Diplomacy, a vital tool in foreign policy, is not a prevalent trait in personalities such as Giuliani’s. Apparently, Giuliani tried to curry favor with the strong Jewish community in the city — a constituency that is key to his political fortunes. Recently, the New York Observer asked, “Can Rudy Giuliani tame the beast within?” Let’s hope he can, for should he fail, the fire he spouts may scorch not only Washington, but instigate a larger conflagration. If the firebrand Giuliani is to take another step up the political ladder, he must curtail his aggressive impulses and appreciate that sometimes — even at the pinnacle of power — discretion is the better part of valor. Next story Will Gore’s little lies be big turnoff for voters? Previous story Is ‘new Rudy’ the real Rudy?